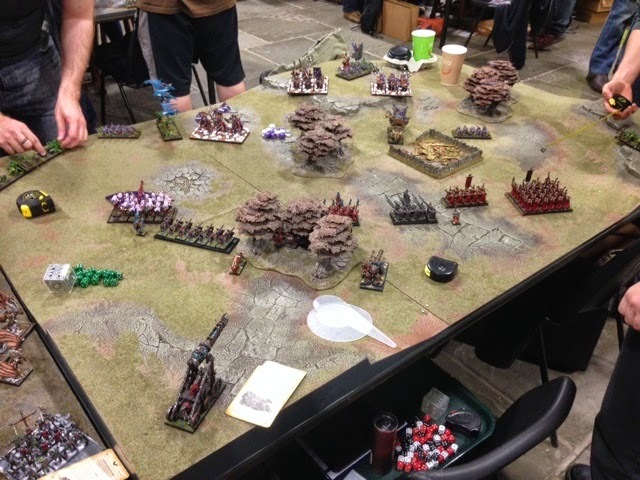 This weekend I journeyed from Blackpool back down to Nottingham for the Warhammer Battle Brothers event; a doubles tournament at Warhammer World, where I was partnering up with a very good friend of mine from back in Epsom. A few of the other Epsom gang were there too, and it was great seeing them. Find out how the weekend went after the break! I arrived in Nottingham (for the first time since my dismissal from GW back in December - a strange feeling) on Friday afternoon after a fairly gruelling train journey and made my way up the canal to Warhammer World, where I met Tosh, Matt and John. It was the first time that any of the. Had come to Warhammer World, so I showed them around a little, then we had a pint in Bugman's Bar whilst we waited for registration to open. David and Matthew arrived shortly after. I had taken a Skaven list thematically based around Clan Skryre (the engineers), and Tosh, my tourney partner, had taken a Dark Elf list based on Har Ganeth. 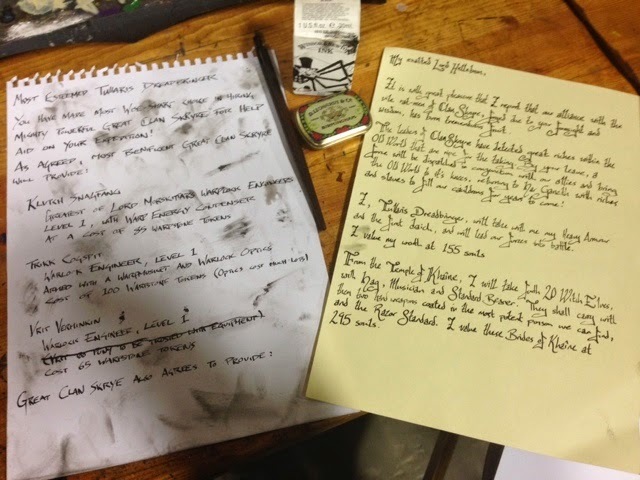 You can see our army lists (hand written with a dip pen and ink!) in the pictures below. Eager to test our lists, as neither of us had actually played the two lists together at all, on account of Tosh living in Epsom, and myself in Blackpool. We befriended a brother and sister team who were taking Dwarfs and High Elves respectively, and challenged them to a game. The game itself ended up being a Dawn Attack, and was good fun, though short lived. 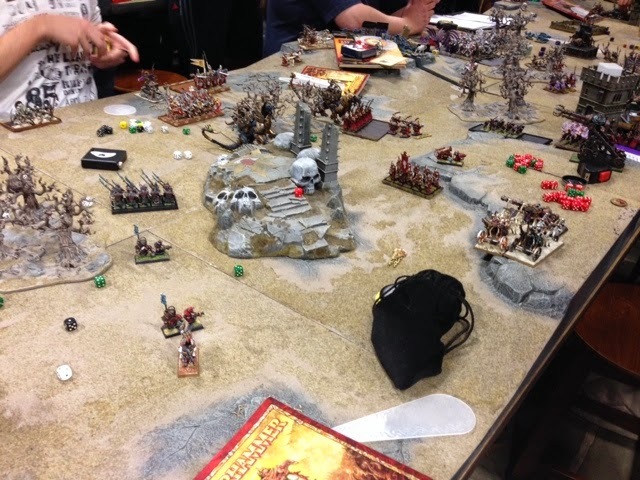 Tosh and I cleared the table quite swiftly, and, pleased with our armies, thanked our opponents and made our journey back to the hotel we were staying in, discussing the forthcoming weekend and having a good catch up. Then came Day One. We caught a taxi back to Warhammer World, enjoyed a Full English Breakfast and prepared for our first game. 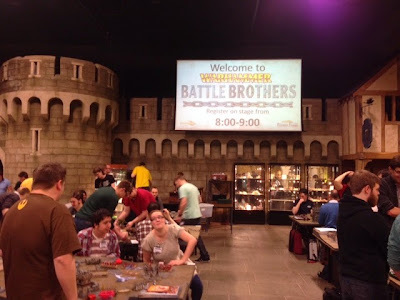 Interestingly, our first opponents I had faced previously in May's Battle Brothers event last year, and whilst they were nice enough, the gaming atmosphere was fairly dry. They weren't win at all costs players, but they weren't engaging opponents either. The mission was a Meeting Engagement, and we set up our armies against their Ogre Kingdoms and Lizardmen combo, featuring Tetto'eko and, of course, Mournfang Cavalry. The game was fairly tense, with a lot of to-and-fro. I would lose a unit to blowpipe induced panic or magic, and Tosh would swiftly mop up a unit with his Witch Elves or Executioners. My participation, on the other hands was abysmal. My war machines either misfired impotently, failed to hit, or failed to wound. My shooting was lucky if it hit, and again, no wounds were caused. At the end of the game, my Skaven force had inflicted a measly ONE WOUND for the duration of the game, and the both of us had been utterly wiped off the table, leaving our opponents to claim a solid victory. Over the lunch break, I entered several models into the painting competition, knowing full well that they wouldn't win anything, but just wishing to show them off to the world and let the Warhammer World Events team take some photos, hopefully to then appear on their Facebook page. Shameless, really. We had an enjoyable lunch, placed our own votes on the Painting Competition, then prepared for Game Two. 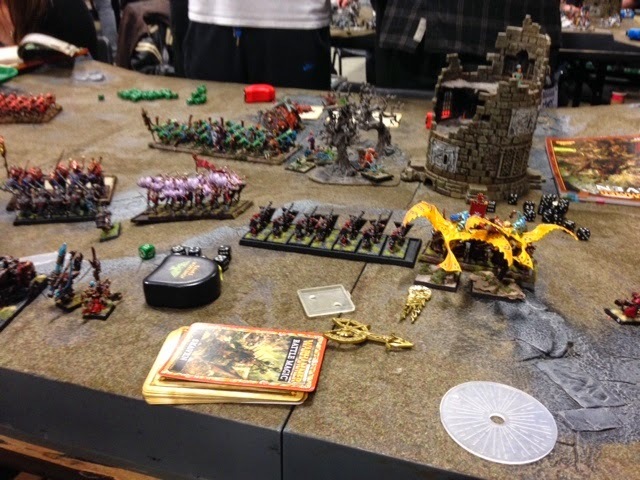 Our opponents for Game Two had brought Warriors of Chaos and Beastmen (one of my favourite armies), and immediately were much more friendly than our first opponents. We laughed and joked, then set up ready to start 'The Watchtower'. 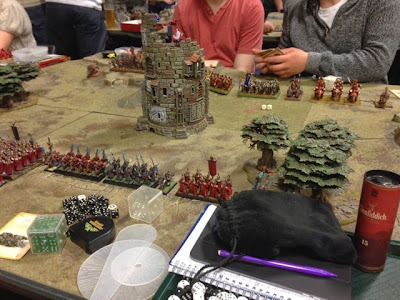 The game began with us in control of the tower, with a unit of Witch Elves garrisoning it. Again, the game was very close. The Witch Elves repelled a unit of Khorne Halberdiers for two turns, then a unit of Tzeentch Swordsmen for another two. My war machines went pig hunting (three Beastmen Razorgors threatened to hit our back line and munch through our Warplightning Cannons) then proceeded to summarily batter the Warriors of Chaos with extreme prejudice. One single Warpfire Thrower held back a chariot's charge for three turns ("Stand and shoot! Hit! 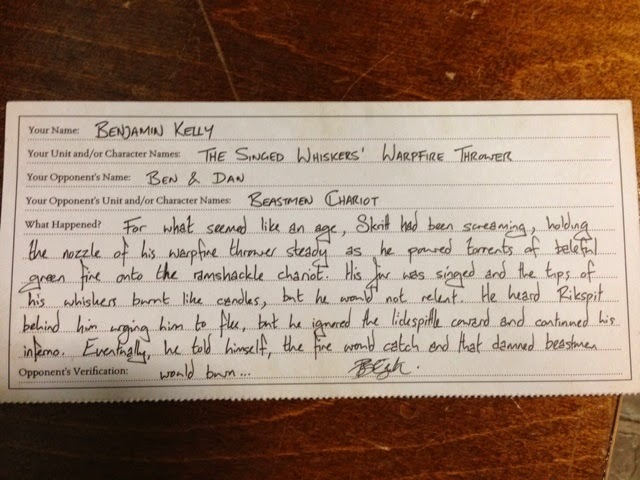 Wound! Damn, you made your 6+ save! And failed the charge distance!" - EVERY TIME) before finally causing a single wound and panicking it away. Sadly, however, on turn five, the Warpfire Thrower then misfired, ran alongside the tower and exploded, killing the last two remaining Witch Elves, leaving the tower open for the Tzeentch Warriors to casually claim on their fifth turn, winning them the game. 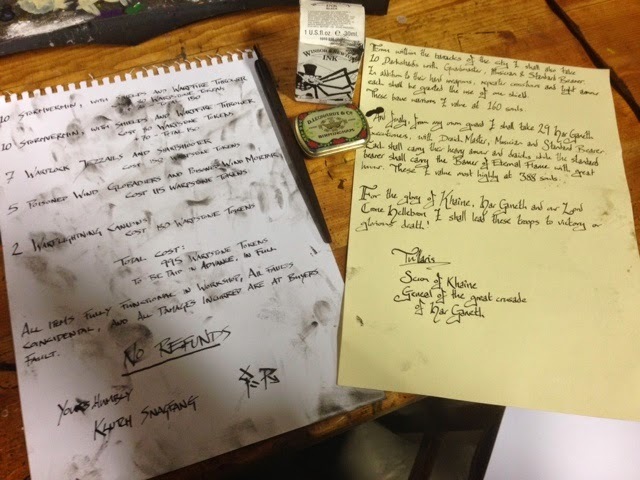 Tosh was not pleased, but hey, he read the terms and conditions on my army list! Game Three was then an utterly different kettle of fish. The mission was 'Blood and Glory' and our opponents were Tomb Kings and High Elves brought all the way from Spain. During the first game I had jokingly nudged Tosh, pointed to the game next to us and sarcastically commented: "You know you're in for a fun game when your opponent is using a laser pointer to ensure precision". I had no idea exactly how true I was. The game itself was dull, utterly uninspiring and uneventful for us as our opponents proceeded to ensure an exactness that would make the most devout engineer tap his foot in frustration. Our opponents argued over minutes of degrees and millimetres in regards to everything from charges to cannonballs, hen had the audacity, when they won the game by causing our Grand General to flee (from a second charge declaration) off the table, to ask if we'd be willing to let them continue mopping up our army for another few turns so that they could claim a few more victory points. We tried to be understanding and keep smiling. Both Tosh and I left that table feeling utterly awful. I cannot remember a game of Warhammer that I have enjoyed less. Anyway, dinner was served (steak), followed by a pub quiz that - continuing the trend - our team didn't win, but we did thoroughly enjoy it. Again, we said our goodnights and made the walk back to the hotel. Day Two arrived in a wet and rainy fashion, and Game Four began. Our opponents had an army of Orcs & Goblins and Skaven, and the mission was a standard Battle Line. The battle was fraught, tense, never appeared to be swinging either way, and both of our opponents were friendly, jovial and even kind enough to buy us drinks! We had some great little moments during the game, from an eagle eyed Goblin Spear Chukka hitting every shot it made (at full distance, through scenery) which eventually got sniped by my Jezzails; to some incredibly jammy Warplightning blasts from both sides; to our Warlock Engineers chasing each other around the battlefield on the final couple of turns desperately trying to slay the other with warp lightning like little rat-men Jedi; to the most pinpoint Doomrocket shot I have ever witnessed. 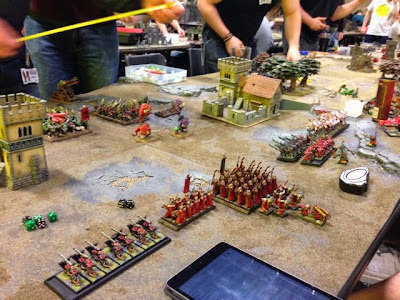 Despite ending in a close loss for us, Tosh and I both agreed that it was one of the most amazing games of Warhammer that either of us had ever played. I spent a bit of time talking with our opponents after the game, only to discover that one of them doesn't live far at all from Epsom and is likely to visit the Epsom GW Gaming Nights. It was really nice to meet such enthusiastic and friendly players, especially after such a gruelling Game Three. Our fifth and final game was against Matt and John, and their Double Lizardmen list (spectacularly named "We Built This City On Gor-Rok And Roll") and was certainly one of the most entertaining games I've played in a long time. The mission was Dawn Attack, and we deployed and began. The game was frantic and hilarious. On turn one, Ripperdactyls leapt over our lines ready to rear charge our ranged units, only to receive a pounding from two Warpfire Throwers, a Poisoned Wind Mortar and a Death Globe, all utterly unafraid of hitting their allies that lay literally just on the edge of their templates. Amazingly, everything hit spot on, and no friendly fire incidents occurred. 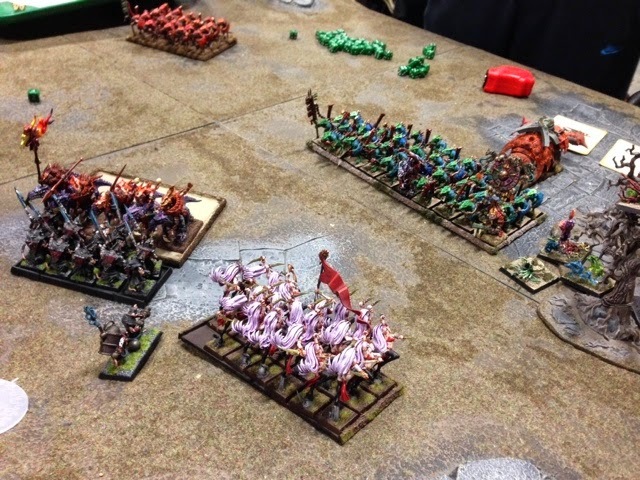 Tosh ran his Witch Elves directly into Gor-Rok and his Saurus horde, sliced a rank of them into ribbons, then got ripped to shreds by the surviving Saurus warriors in return. Not a single Witch Elf survived. Having just munched a unit of Stormvermin, their Cold One Knights overran and ended up 6" in front of my Warplightning Cannon (a terrifying prospect!). As they prepared to charge in their next turn, the Warplightning Canon misfired, spinning on the spot and fired, directly at the Cold Ones, then rolled abysmally for the range: seven measly inches. It was only then that I remembered that the spinning misfire shot from a WLC terminates in a large blast marker, wiping the Cold One Knights off the table in a spectacular point blank explosion! Then Gor-Rok and his unit hit home, alongside Teneheuan and his jungle swarms. Together, they proceeded to march up our battle line and munch everything. A couple of astonishingly lucky risky WLC shots (in that they bounced right through the units they were firing at, but stopping just short of hitting the friendly units JUST beyond) later, and it was all over. The unit of Executioners that Tosh had left twiddling their thumbs in a Venom Thicket and a handful of Darkshards were all that remained of our force, leaving only Gor-Rok, a Saurus Scar Veteran, three Saurus Warriors, Teneheuan, a jungle swarm and a Bastilodon left. Despite the exceedingly small model count remaining on their side, we'd failed to finish off the biggest unit (the Saurus) or either of their generals, giving them a crushing victory over us. The award ceremony came and went with the usual suspects winning (beardy tournament gits who took it too seriously winning the games, and Rich Packer not only winning the painting competition as usual, but actually winning all three categories). We packed up, said our goodbyes and went on our ways home, thinking intently on what we might take to the October Battle Brothers event. So far, Double Tomb Kings or Double High Elves seem likely. There were only two complaints I had about the tournament. Firstly, the abundant use of very powerful Warhammer Forge models (one list was running two K'daai Destroyers alongside two Terrorgheists; we saw three or four Toad Dragons...), which wouldn't be a problem if it had been clearly mentioned that it was allowed in the rules pack. Jealousy? Maybe. I've got some WF kits I've wanted to use in games for a long time now. I wish I'd known I could bring them. Ah well, all said, we'll doubtless be back again! Teams that for instance were taking units entirely comprising of Perry Miniatures, or teams that had unpainted models in their units (I know how stressed I got getting my Witch Elves finished, and now I wonder why I was bothering? ), and a team that had a unit of chariots completely devoid of movement trays. I do understand GW's position of not wanting to remove people from a tournament they've already paid for, so the 15000pt bonus for obeying the rules seams like a lovely way of rewarding those who comply. It is however entirely pointless if not enforced. A great report (and accurate) on Battle Brothers - We were your opponents game 4 - Gareth & Andy 'The Green Rats'. It was a terrific game and you were both a pleasure to play. Great to hear from you guys! Genuinely, Game Four was out best of the entire weekend. Thank you again!